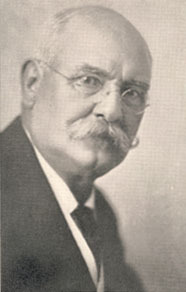 Charles Campbell MD (1865 --1931). 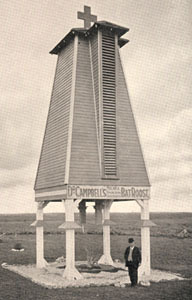 Bats, Mosquitoes and Dollars by Campbell, Dr. A. R., The Stratford Company, Boston, Mass., 1925. Dr. A.R. Campbell (another Great Scot) was a Texas doctor who discovered that smallpox was only spread by the bite of the bloodsucking insect called the BEDBUG or Cimex Lectularius. Cimex is the Latin for "bug" and Lectularius is Latin for "couch" or "bed." Dr. Campbell proved that smallpox is not contagious and is not an airborne disease. Dr. Campbell graduated from the University of Tulane Medical School and was licensed to practice medicine by the State of Texas. He was president of the San Antonio Academy of Medicine and was a member of the Bexar County Medical Society. Dr. Campbell was another victim of the Medical Inquisition. This great doctor, scientist and naturalist is not mentioned in any of the hundreds of biographies on medical men and their discoveries. Dr. Campbell discovered how to colonize bats in order to destroy the malaria carrying mosquito. Dr. Campbell was the head Bacteriologist for the city of San Antonio, Texas. His work on eradicating the malaria causing mosquito led him to construct a BAT HOUSE and colonize bats as you would bees. For his great discovery, he was nominated for the Noble Prize for Medicine by the State of Texas on Feb. 10,1919. Dr. Campbell is nominated for the Noble Prize for Medicine. RESOLVED, by the House of Representatives, the Senate concurring, that the Legislature of the State of Texas, endorse the work of Dr. Chas. A. R. Campbell in his original and thoroughly scientific work, and respectfully suggest and commend his name as worthy of the greatest reward for the service of humanity, a Nobel Prize. Mitchell's Lake Bat Roost. Portion of Mitchell's Lake in background. 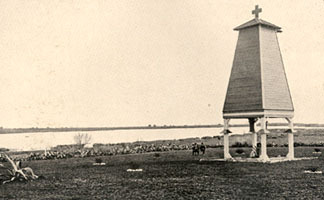 Mitchell's Lake is located about 10 miles from San Antonio, Texas. The lake covers an area of about 900 acres. Into this lake, flowed by gravity all the sewage of the City of San Antonio (population in 1920 of 161, 379). Before the Bat Roost was built, mosquitoes bred in such numbers as to actually drive the men from the work of irrigating their crops at night, and forced them to let their crops go to ruin. 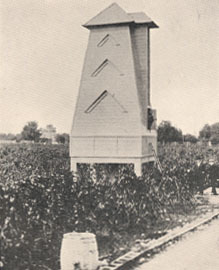 Within 3 years of its construction the mosquito problem was well under control. Alamo Heights Bat Roost showing Academy in the background. This shows how close to a school a Bat Roost can be built with no ill effects to children unlike the poison needle of vaccination. 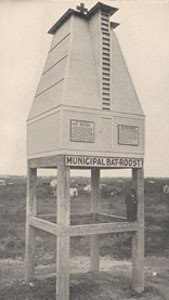 Municipal Bat Roost, erected by the City Council of San Antonia, Texas, March 17, 1916. 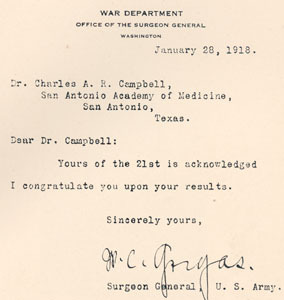 A letter to Dr. Campbell from W. C. Gorgas, Surgeon General of the U.S. Army. Foreign Nations loved his Bat House. Dr. Campbell was inundated with letters from around the world requesting more information on his Bat House. 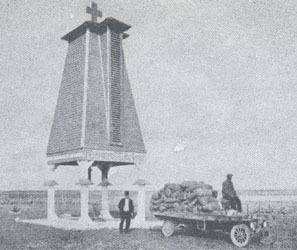 Bat Roost erected near Colonia Elena on the Pontini Marshes, Province of Rome, Italy, 1924. 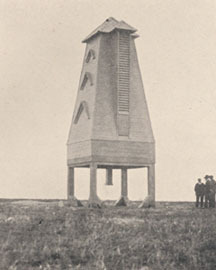 Bat Roost erected on the property of Signor Ugo Natali in Terracina, Province of Rome, Italy, 1924. These Bat Houses were more beneficial to the people of Italy than ALL the popes that ever lived!! 3 boxes of "bait" consigned to General Marini on board Italian S.S. Nicolo-Odero, March, 1925. 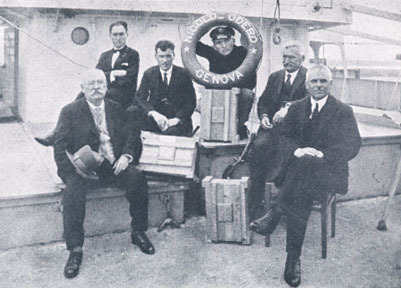 Captain, Steamship Agent, Chief Officer, Italian Consul, Chief Engineer, and Author. Dr. Campbell finds the cause of Smallpox. All of the Bat House experiments were financed by Dr. Campbell from his modest income as a physician in San Antonio. His other great passion was finding the CAUSE of smallpox which was ravaging Mexico just across the border. Like any REAL Doctor he was more interested in finding the cause of a disease than treating the symptoms. Foreword By J. A. L. WADDELL, D.E., LL. D.
When the good doctor used the title for his book, Bats, Mosquitoes and DOLLARS . . . he wasn't talking about dollars from the Rockefeller Institute, the Federal Government, the Nobel Prize money or the drug companies. He received NO money from any of those sources. He was talking about bat droppings which are called GUANO. Unlike bees, bats do not make honey but they produce a high potency fertilizer called GUANO. Guano can be used as a high potency fertilizer because it is rich in iron and other minerals. Dr. Campbell was able to use the money from the sale of GUANO to further his scientific research. Guano crop to market -- 4012 pounds. 4 year old Pecan tree fertilized with bat guano.